Range of executive chair with advanced synchron mechanism. Totally made of cold injected polyurethane foam, the backrest is equipped with 2 elastic belts that ensure the top in comfort. The chair is available with upholstered armrests or chromed oval steel tube. 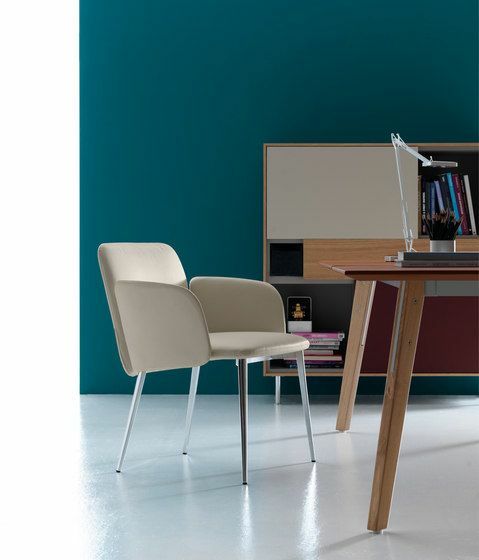 The shape of the seat and armrests is conceived to hide all mechanism for adjustment. Aura chromed steel base (diameter 70 cm). The range is available in 3 different heights. The chair is also available with 4 chromed tube shape legs that gives to the chair modernity and adaptable for every environment, also available with or without armrests. Hanami is also proposed in Soft and Slim version, Soft with upholsteries realized in order to create soft and irregular folds with a “vintage” effect. All Hanami chairs can be also personalized with different upholsteries even for single part of the chair.